Jazz lore is filled with stories of the “Blowing Session”; where the great instrumentalists who played the same instrument, would gather on a stage and demonstrate their prowess. Usually this would begin with the basic head arrangement of a well known standard and from there, the combatants would take things to the next level, in their solos, each vying to outdo the last. Often, these were friendly completions; other times, if some of the cats had “beef” with each other, this could be a battle nearly to the death. Sometimes, the cats would take these battles to the studio. There, we would get a mixed bag; the constraints of studio time costs and realizing that the results would have to fit onto at least one side of an LP, could dampen some of the fancier flights. However, we still have some classic and near classic recordings, and many of these, to no surprise, involved tenor saxophone players. I’ll drop a list of some of the best at the end. Right now, you need to know about a little bit of the revival of that tradition that will be happening in Charlotte, NC on January 17 – 19, in Jazz Arts Initiative’s THE JAZZ ROOM. We will have have some of the finest tenor players from the area, coming together to do battle. Each will appear with our all-star rhythm section (Lovell Bradford – piano; Aaron Gross – bass; Malcolm Charles – drums) and in various combinations on stage together. The musical sparks are bound to fly! The accompanying clips are samples of a few of our tenor masters, smokin’ their way through some of their prior gigs. Now, image what we will get when we bring all of these ingredients together. Two sets nightly, from Thursday, January 17 – Saturday, January 19, means you will have six opportunities to be a part of JAI’s Tenor Madness. Thursday and Friday, the times are 6:00 pm and 8:15 pm; Saturday sets are at 7:00 pm and 9:15 pm. THE JAZZ ROOM is located at The Stage Door Theater at the Blumenthal Performing Arts Center. I will be your MC for all sets but please don’t let that stop you from coming! 1991 was a relatively heady time for the jazz business. In addition to all of the reissues of classics on the still ascendant CD technology, record labels were rushing to sign promising young musicians, in their search for another Wynton. Among them were five tenor saxophonists, brought together for a one-off album by Antilles Records. None of them were well-known at the time, but they were unquestionably gifted. Their names were Walter Blanding, Jr., James Carter, Herb Harris, Tim Warfield, Jr. and Todd Williams. 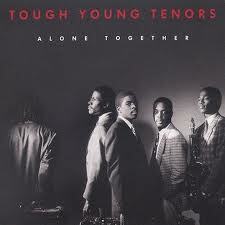 They were called “The Tough Young Tenors”. The title of the album: Alone Together. Backed by an all-star rhythm section of Marcus Roberts on piano, Reginald Veal on bass and Ben Riley on drums; these brash youngsters showed that they had the goods. In solos, duos and finally in a five sax free-for-all on Sonny Stitt’s classic “The Eternal Triangle”, this album proved to be more than a blowing session – it was one of the best jazz albums of the year. At the time we knew that these cats were all destined for jazz stardom. It did not turn out that way. Though he has only one album to his credit (2000’s The Olive Tree), Blanding has been quite active. He has been a member of Wynton Marsalis’ septet and his other recording credits include Marcus Printup and Eric Reed. He’s currently a member of the Lincoln Center Jazz Orchestra. The great Jimmy Heath said about Blanding in the May 2011 issue of JazzTimes, “I call him ‘Walter Spicy’, ’cause there’s nothing bland about him”. Carter is without question, the most commercially successful of the Tough Young Tenors and one of the most well-known jazz musicians of his generation. New York Magazine called him “Jazz’s first rock star” (though I still believe that title belongs to Miles Davis). His debut album JC on the Set took the jazz scene by storm in the year after Alone Together. Carter was just getting started. His 14 albums under his own name between 1992 and 2011, have fearlessly covered the jazz spectrum, from standards, to funk, to avant-garde. He has also made guest appearances with many of jazz’s legends, from Hancock to Golson to Wynton. Already this year, James Carter has released a new album, Caribbean Rhapsody and appeared on his first disc as the newest member of the venerable World Saxophone Quartet, Yes We Can. What was predicted for all members of the group, Carter has achieved. Like many most of the members of the group, Harris logged some time with Wynton, highlighted by his appearance on the Tune in Tomorrow soundtrack. He also appeared on Marcus Roberts’ dynamite Deep in the Shed. However, he has undeservedly languished in obscurity for most of the last 20 years. He has released two competent, if unspectacular albums as a leader: NY Daze & Knight, from 2001 and the contemporary flavored Some Many Second Chances in 2009. Mr. Warfield has been the most prolific of the TYTs, next to Carter. In addition to releasing six critically acclaimed albums on Criss Cross Records, (his latest is A Sentimental Journey) he has worked with a veritable who’s who of jazz, including Stefon Harris, Christian McBride, Nicholas Payton, Shirley Scott, Jimmy Smith and Terell Stafford. He is currently an artist in residence at Messiah College in Grantham, PA. He also recently accepted an adjunct professor position on Temple University’s music department faculty. Todd Williams spent over a decade with Wynton Marsalis following TYT. He appeared on some of Wynton’s classics, such as the Soul Gestures in Southern Blue series and In This House on This Morning. Williams was also a long time member of the Lincoln Center Jazz Orchestra. The quintessential sideman, Williams has yet to release a jazz album as a leader. Always a man of great faith, Todd decided a few years ago to leave Wynton and the LCJO to concentrate on his duties as minister of music at NYC’s Times Square Church. At the church, he has produced an album of gospel music and spirituals, called Beautiful Things from Above. Within the last 18 months, Todd has been quietly making appearances again on the jazz scene, leading a group in the Hudson Valley area and making a notable appearance with pianist Eli Yamin, at a White House gala. So we find that 20 years later, these tenors are still on the scene and still pretty “tough”. If you haven’t checked any of them out in a while, now is a good time to get reacquainted.